PDR Voice Over Coaching W/ Peter Rofe. 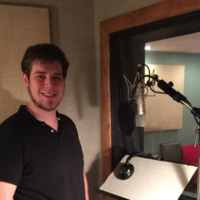 Peter Rofe has been a working voice over artist for 20 plus years and regarded as one of New York's premiere voice over coaches and I continue to train with peter on a monthly basis doing workshops as well as private lessons. Studio Equipment- Audiotechica AT2035 Cardioid Condenser Microphone, Focusrite Scarlett Solo, Adobe Master Suite.